Have you ever gone shopping for a new hairbrush and been overwhelmed by all the shapes, sizes, bristle types and other features? When you look for a brush, you’ll see everything from metal, wood and plastic to wire and ceramic. Some are ionic while others are thermal. There are small ones and jumbo ones and everything in-between. How are you supposed to choose the best one? Brushes aren’t made in such a wide variety for the looks only – the shape of the brush you choose plays a major part in styling your hair. If you want to get a professional blowout at home, you’ll need to find the best round brush for blowout depending on your hair type. Remember, all round brushes are not created equal. They’re made with different materials and come in different sizes. Again, this is not just for the looks. Each size brush and type of material is designed especially for a particular type of hair. We’ve put together a list of the top five round brushes on the market to help you get a great looking professional blowout at home. There’s a brush on our list for every type of hair, so take a look and find the one that’s right for you. 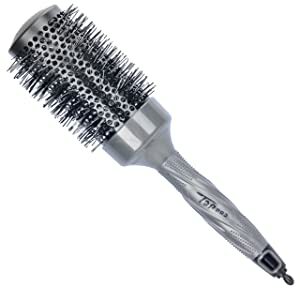 The Olivia Garden Nano Thermic Ceramic Ion Brush is designed with a thick barrel of 2 1/8 inches. It reduces drying time by using extra-large vents that allow the air to flow through the brush easier. The heat-resistant, wavy bristles are uniquely designed with soft tips, making this brush gentle on the scalp and hair. The main feature of this brush is its ability to heat up faster and hold heat longer than most brushes on the market. The Ergo Professional Round Brush is made with a ceramic barrel, a non-slip rubber handle and heat-resistant nylon fiber bristles. This is an excellent brush for normal, thick or coarse hair. The ceramic barrel holds heat, helping you to create curls or straighten your hair. The main features of the brush include its long barrel, which is around one inch longer than the average round brush, as well as its ionic design. When heat and tension are applied to the brush, negative ions are released into the hair, helping to condition it and repair cuticle damage. The Ibiza Hair Extended Cork Round Brush EX4 is designed with a unique extended cork handle. The bristles are made of a combination of natural boar and heat-resistant carbon fiber nylon. The brush is very lightweight due to the innovative cork handle. The size of the brush and bristle type make it ideal for working on medium to long hair with styles that focus on the crown of the head. The best feature of this brush is the light weight and good grip that the cork handle provides. The Spornette #855 Italian Collection Jumbo Round Hair Brush measures in at a voluminous three inches. It’s made of fine Italian wood with pure boar bristles. 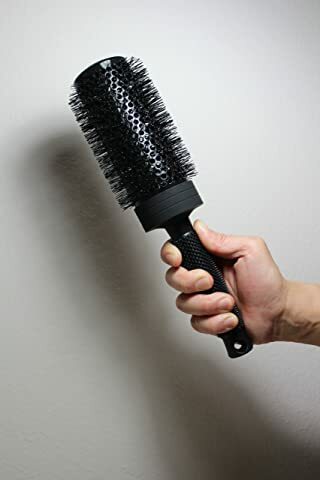 This is an awesome brush for creating lots of volume. The jumbo size lifts hair and helps create volume from the roots down to the tips. The best feature of this brush is its jumbo size. It helps dry hair faster and create loads of volume. The boar bristles also help nourish hair and keep it looking shiny. The Suprent Nano Thermal Ceramic & Ionic Round Barrel Hair Brush combines all the best features of any round brush and puts them all together into this one super blowout tool. The ceramic handle heats up fast and retains heat. It’s also designed with extra-large vents that provide excellent air flow through the brush. The two-inch barrel of this brush makes it ideal for medium to long hair. The main feature of this brush is its ability to dry hair super-fast while creating a variety of different styles easily. When you’re looking for the best round brush to blowout your hair, there are a few important factors you need to consider. With so many different types of brushes available, you might not know which one is the best for you. You need to understand the materials and designs of the brushes as well as your hair type in order to match the right brush with your hair. Here, we’ll walk you through the different types of brushes and what kinds of hair they work best for. Pure boar bristle works best on fine to normal types of hair. Boar bristles are great at lifting away dust, dirt and debris. Not only that, but they redistribute the natural oils in the scalp through the hair, from root to tip. If you have damaged, delicate or thinning hair, use a brush made with soft boar bristles. Nylon bristles work excellent on really thick or coarse hair. These bristles are strong and thick enough to penetrate through thick hair, coarse hair and hair that’s difficult to tame. The stiffness of the bristles offers more control than all-natural ones. Mixed bristle brushes are made with a combination of nylon and boar. If you have normal to thick hair, this type of bristle is an excellent choice for you. They offer the stiffness of nylon to detangle the hair, while the boar bristles take the natural oils from your scalp and distribute them throughout your hair. Wooden bristles were designed to tame the most difficult to brush curly hair. Wide-spaced, thick wooden bristles are the answer to all your hair brushing troubles if you have a curly head of hair. They will brush through without separating curls and they never create static. Wooden bristles are also excellent for people with dry and brittle hair. Ceramic brushes heat up very easily, making them an excellent tool for curling or straightening hair. When you use a blow dryer on a brush with a ceramic barrel, you can turn the brush into your own personal flat iron or curling iron, depending on the style you want. While many brushes are designed to work best with a particular type or length of hair, a ceramic brush is good for all hair types and lengths. Metal brushes are the worst for natural hair. Metal bristles are inflexible, even if they’re coated in plastic. They have a tendency to pull on hair, causing damage to it. This type of brush is also known to generate a lot of static. However, if you’re working with a synthetic hairpiece or wig, a metal brush may be recommended. Vented brushes are great for helping you create a hairstyle with lots of volume. They’re designed with plenty of space for air to flow through the brush, which decreases blow drying time significantly. Now you have the information you need to choose the perfect brush for your hair type. 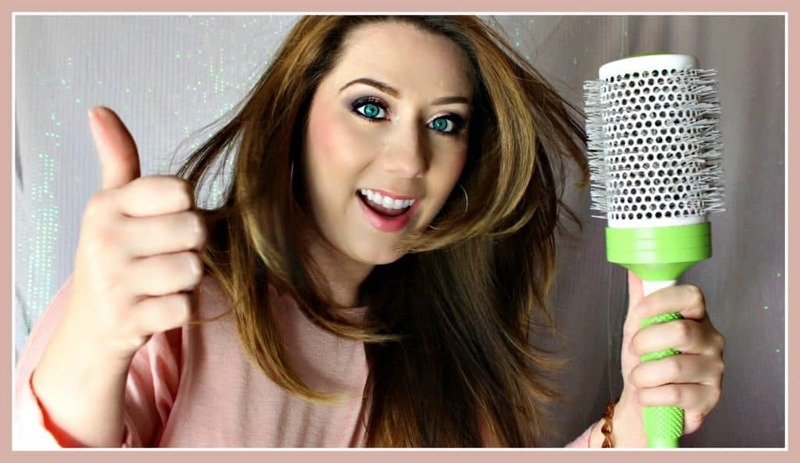 Whether you have thin hair, damaged hair, super curly locks, a coarse mane that’s difficult to tame, or are just looking for the best brush to keep your normal to thick head of hair healthy, there’s a brush out there for you. From the bristle types to the brush material, there are plenty of options out there that will help you keep your hair healthy and strong no matter what type of hair you have. Choosing the right material and bristle types also allow you to create the style you’re going for. Follow our simple buyer’s guide and choose the right one for you. Professionals make blowing out hair with a round brush look easy, but if you’re new to the process you might be faced with a serious struggle when trying to use a round brush on your own. If you don’t know how to use one properly, it can get tangled in your hair pretty easily and you probably won’t be able to master the style you’re going for. To get you started on the right foot, here are some pro tips for you to follow. Following these tips will give you a soft, natural looking style without damaging, tangling or frizzing your hair. The most important things to remember are that when you use the brush and hairdryer horizontally, all your hair will curl under, so avoid this if you want a wavy look. Also, blowing out your hair on high heat will lead to damage, tangles and frizz. Remember those two things and the tips above, and you’ll be blowing out your hair like a pro in no time. Round brushes are great for a variety of hair styles, but you have to choose the right one for you. We hope that we were able to help you find the best round brush for blowout with this ultimate buyer’s guide. We’ve provided you with a number of options and pro tips to help you achieve whatever look you’re going for and the healthy, shiny locks you deserve.